The first trailer for The Addams Family animated movie is finally here. The movie doesn't open until October, but it's never too early to get a sneak peak at something involving The Addams Family. Directors Conrad Vernon and Greg Tiernan previously announced they were taking inspiration from the original comic series by Charles Addams from the New Yorker and they weren't kidding. Gomez, especially, looks a lot like the comic version of the character who was first introduced in 1938. The Addams Family animated movie is looking to introduce a new generation to the kooky and spooky family. The franchise had the successful TV series in the 1960 and then the big screen adaptations in the early 1990s, which was also successful. However, it has been a while since we've seen the family on the big or small screen. Tim Burton famously tried to get a stop-motion animation version in 2013, which would have been awesome, but that obviously did not end up happening. This leads us to the new 2019 animated movie with a new look and feel from past versions. The project was officially announced in 2017 and we've waited since then to get our first look at the movie. 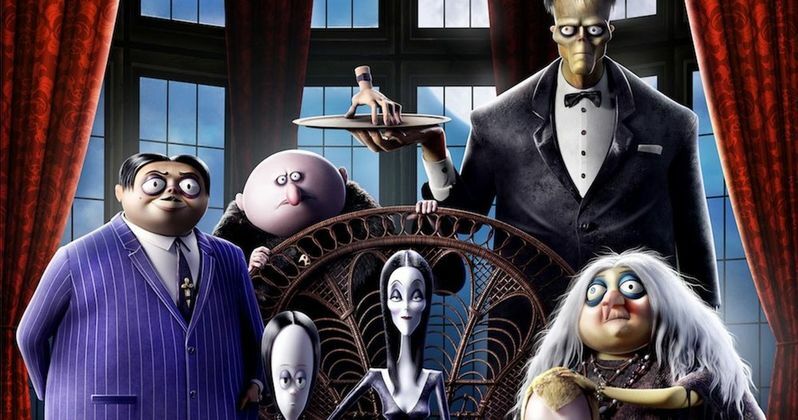 The Addams Family animated movie stars Oscar Isaac as Gomez, Charlize Theron as Morticia, Chloe Grace Moretz as Wednesday, Finn Wolfhard as Pugsley, Nick Kroll as Uncle Fester, and Bette Midler as Grandma. Alison Janney plays the reality-TV host Margaux Needler and Elsie Fisher plays her daughter Parker. Coming up with a voice cast for the family must have been nearly impossible to do, but Conrad Vernon and Greg Tiernan seem to have pulled off an epic cast to play the iconic family on the big screen. Everybody sounds great when paired with their characters. Conrad Vernon and Greg Tiernan are directing The Addams Family animated movie from a script by Matt Lieberman (The Christmas Chronicles). Vernon is producing with Gail Berman and Andrew Mittman, Kevin Miserocchi, and Joe Earley are on board as executive producers on the project. Cinesite Studios did the heavy lifting with the CG Animation and digital visual effects production, which looks excellent and in line with the original comics, but with a new and modern touch, which isn't intrusive. Everything looks natural and retains the family's love of everything dark. The Addams Family animated movie hits theaters on October 11th. Depending on the popularity of the movie, we might see even more Wednesday Addams costumes, along with the rest of the gang on Halloween night, which definitely isn't a bad thing. However, it would be cooler to see some Lurch and Uncle Fester costumes walking around parties or trying to get some candy. While we wait for the Halloween season release, you can check out the very first footage from The Addams Family animated movie below, thanks to MGM.